Monterey, San Jose, Vallejo, Benicia and San Francisco, temporary capitals from 1850-1854. Sacramento since 1854. September 9, 1850, 31st State. California is bordered on the west by the Pacific Ocean and on the south by the country of Mexico. Constitution: California Constitution, 25th state to enter the Union. Manufacturing: Electrical equipment, components and military communication equipment, are California's leading manufactured products including electronic systems for aircraft and missiles. Other products are audiotape and videotape, lighting equipment, and telephone equipment. Manufacture of computer machinery ranks second in production, followed by food product processing of baked goods, beverages, canned fruits and vegetables. Services: Community, business, and personal services form California's leading service industry, including private health care, law firms and engineering companies, hotels and entertainment companies, and repair shops. Real estate, finance and insurance form the second-ranking service industry in California followed by wholesale and retail trade in food products, medical supplies, motor vehicles and petroleum products. Mining: California is also among the country's leading mining states with producing a greater variety of mined products than any other state. Oil is the number one product. California mines all of the boron that is produced in the United States. It's the leading producer of diatomite, sand and gravel, sodium compounds, and tungsten and among the top producers of gold, gypsum, magnesium compounds, molybdenum, perlite, potash, and pumice. Highest Point: Mt. Whitney, 14,494 feet above sea level, the highest point in the continental United States. 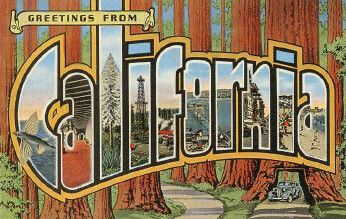 Natural Resources: California is unusually rich in minerals and timber. The state's soil and climate make it possible for farmers to grow an enormous variety of crops.